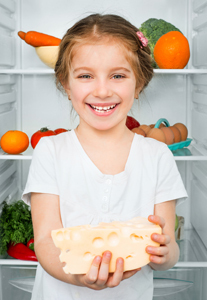 ﻿ Is dairy crucial to my child's oral health? Healthy eating, combined with regular physical activity, plays a vital role in your child’s health and well-being. Dairy foods are naturally nutritious, packed with ten essential nutrients that help your child feel good for life. But did you know that dairy is also great for your child’s dental health? Our team at Dr. Friedman, DDS will tell you that, in addition to providing large amounts of much-needed calcium, dairy products also help fight cavities! Dairy products have a specific role to play in dental health as they contain a unique combination of special anti-decay nutrients such as calcium, phosphorus, and the protein, casein. Cheese is especially useful, as eating a small piece of cheese after consuming sugary foods or drinks can help protect teeth and reduce the risk of tooth decay. If you’d like to know more about the importance of dairy products in your child’s diet, or about any aspect of your child’s dental health, feel free to ask Dr. Philip Friedman at your next appointment!